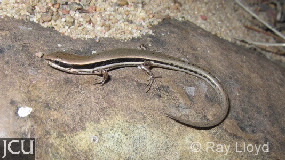 This skink is chiefly found in tropical woodlands in grassy areas. The body is a coppery brown to bronze usually with darker mottles on the tail resembling a row of dots. There is a very dark broken stripe, or series of large mottles that runs from the snout to the hind legs and is bordered by paler stripes. The belly is white with obscure markings. Five digits per limb.